My name is Nilanj. I began my Camino Story on May 15, 2014 in St. Jean Pied de Port, on the French side of the Pyrenees Mountains. I showed up there alone. I had never seen ‘The Way.’ I finished in late June after I learned to stop counting the days and cataloging the dates, and rather to enjoy every minute of the journey. There were countless amazing days and countless memorable encounters. I downloaded and watched ‘The Way’ literally while on The Way, and I acquired a new nickname, “Señor Vino.” This is the story of my Camino. But, it wasn’t just “my” Camino story. I made a pair of friends who were a constant source of joy, jokes, blister bandages, trail mix, spare change, duct tape, sous-cheffing, and extra water. Nearly a year later, they helped me get this project off the ground. David and Greg were 66.67% of the famous “Three Amigos,” and they enriched my Camino and my life. We started this website because we noticed that nearly all of our fellow walkers had very interesting reasons for hiking the Camino. We all had remarkable, even profound experiences, yet we didn’t see anything that really captured these amazing, vivid stories. Most online message boards or Facebook groups are great about telling you how heavy your backpack should be, what to use to protect against bedbugs, or how to prevent blisters. But I found nothing truly inspiring, that might really excite a prospective pilgrim about the journey, or that might cause someone to go who might never otherwise have considered it. Nothing to capture how much of a life-affirming adventure this has been for hundreds of thousands of peregrinos. This is intended to be that. 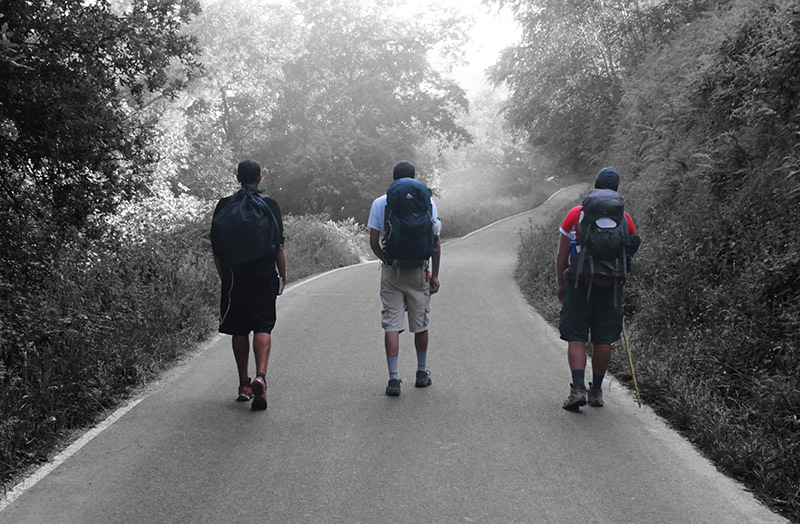 These are our Camino stories.